The family of animals that we call Lemurs is a diverse group in the primate order. They are classified as prosimians which literally translates as pre-primate and more closely resemble their ancestors of millions of years ago rather than modern primates or monkeys that we are familiar with. All Lemurs are found only on the African islands of Madagascar and the Comoros islands located east of Mozambique in Southeast Africa. Because of this geographic isolation they have developed into their own unique group, but also this isolation has aided in making them endangered. Experts have decided at this point have determined that there are five families, which represents some dozen genera which in turn are made up of some 50 species and sub- species of lemur. This volume of diversity results in a large range of variety within these species. Lemurs vary in size from the mouse lemur which only weighs around 1 ounce to the indri that weighs around 15-pounds. Like the rest of the primates, lemur have hands and feet with five digits each with a flattened nail rather than claws. Some of the species are nocturnal using the safety of darkness to become active. Some are diurnal which means they are generally active during daylight hours and sleeping at night. Most of the social species that interact in groups are diurnal. 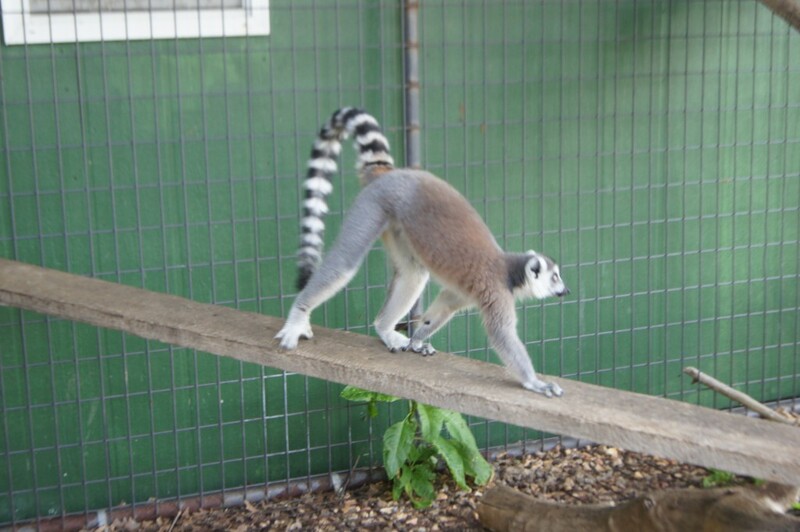 At Liar’s Lake we currently raise the well-known ringtail lemurs, Lemur catta. These delightful creatures are familiar to most us by their long black and white striped tails. While most species of lemurs are arboreal, or living the majority of their lives in trees often in the rainforest canopy but they also move to the midrange tree line and bushes, Ringtail lemurs are unusual in that they spend the majority of their time on the ground. They forage for food which consists mostly of fruits and berries, but also will eat a variety of leaves and occasionally insects. In captivity we have the luxury of prepared diets that meet the bulk of their nutritional requirements. In addition to this diet and plenty of clean water they will enjoy a large variety of additional foodstuffs such as fresh fruit, vegetables and nuts. Ours love treats of cookies and sweetened cereal (especially Fruit Loops) which as with us human primates should be offered in limited quantities. Ring tails are mostly known for their long tails that are longer then their bodies. These tails serve a balance function, a communication tool when waved in the air. Unfortunately they cannot swing or hold onto trees with the tail as their relatives with the prehensile tails can and therefore they must utilize their hands and feet to move and swing around. The male also uses his tail during breeding season to prove just how smelly he can be by rubbing scent secretions on it and then waving it around. Apparently the stronger the smell the more desirable he is to females and the more powerful he is to his rivals. It is the female, though, that chooses her mate as they are the dominant members of the troop. Ringtail Lemur are an endangered species so they cannot be sold across state lines unless both seller and buyer have a permit for that endangered species. We only sell our youngsters to Missouri residents and emphasize that wild animals are not pets. This is hard for most buyers to understand as these critters exhibit many humanlike characteristics. With the proper care and experience the raising and keeping of ringtails is very rewarding.